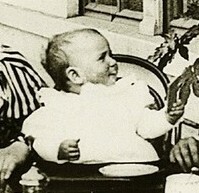 The celebrated baby in the Lumière film Le Repas de bébé (Baby’s Breakfast), Andrée Lumière was born on 22 June 1894, just days before Edison’s Kinetoscope appeared at the offices of le Petit Parisien in Paris. Shortly afterwards, the Lumière brothers commenced their Cinématographe project. Just before her first birthday, Andrée appeared in two films screened for the Congress of French Photographic Societies in Lyons; Le Repas de bébé and Pêche aux poissons rouge. At the now famous 28 December 1895 show in Paris, a wider public was able to see these films, and Le Repas de bébé has since become one of the iconic motion pictures of the beginnings of cinema. We see young Andrée with her parents, Auguste and Marguerite, enjoying their breakfast in the open air in the garden of their home at Lyons, in the Spring of 1895. Uncle Louis is operating the camera. Auguste energetically spoons baby food into his daughter’s mouth, and then hands her a biscuit. She is about to nibble it, but becomes aware of someone on the other side of the camera - her aunt Rose, perhaps - and offers it to them instead. Scenes like this would become the mainstay of generations of amateur moviemakers worldwide. Pêche aux poissons rouge (Fishing for Goldfish), filmed at about the same time shows Andrée, supported by her father and very camera-aware, dipping her hands into a large goldfish bowl. In the behavioural study Querelle enfantine (Children’s Quarrel) (1896) Andrée shares the scene with (most likely) Louis’s daughter Suzanne, three months younger. The two children, in their crinkly lace summer bonnets, are seated next to each other with their playthings. A feisty Andrée reaches over to take something from her resistant cousin and fails, so slaps her face. Suzanne starts to cry and grabs Andrée’s spoon, leading to more slapping and further crying as she retrieves it, and peace is restored. Finally, most likely as a response to a call from the director, Andrée turns to look at the camera. The young Lumière children and their Koehler and Winckler cousins would appear in other 1895 films, including Enfants aux jouets. In Retour d'une promenade en mer (1896) the children greet the arrival of a boat on the quay at Le Ciotat, the Lumières’ summer retreat; they later appear at the resort’s railway station, amongst those awaiting the famous train in the third and most commonly shown version of L'arrivée d'un train en gare de La Ciotat (1897). Premiers pas de bébé (Baby’s first steps), released in 1897, has Andrée’s cousin Madeleine Koehler toddling along a concrete path, and being allowed by her nursemaid to trip into a huge crack; evidently a ‘set-up’. She would later star in La petite fille et son chat (1899). Despite being articificially arranged, these shorts reflect the comfortable lifestyle of a bourgeois French family in the closing years of the 19th century, providing a unique record. 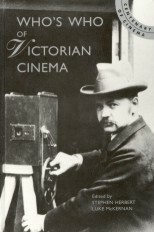 They signalled an avalanche of ‘baby films’, from Robert Paul’s Twins’ Tea Party (1896) to American Mutoscope’s When Babies Quarrel (1899) and beyond. With the development of the Lumière Autochrome system of colour photography (invented in 1903) we see Andrée - a principal subject in the family’s own photographs taken with the process - blossom from child to young woman, posing with a red parasol or colourful dress. For some years she assisted her father in his medical research work, but died tragically young during the influenza pandemic of 1918.